Each day we rehearsed for several hours, planned for the future, enjoyed some delicious meals, exercised together, and had some cozy time by the fire a couple of nights. After knowing one another and playing together for so many years, we know well our individual styles of learning, and have organically melded a group learning style that continues to evolve. 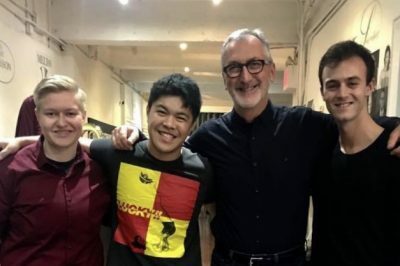 As individuals, we do our very best to come to each rehearsal in full command of our individual parts and having assumed full responsibility for knowing the score, knowing how our parts fit together. Especially when learning pieces that are new for us, that means investing time prior to the first rehearsal marking in cues so that we can anticipate and eliminate challenges before they arise. I never want to ask the question “What do you have at letter D?”, for example, because that’s a waste of everyone’s time and energy. (I shudder to recall how many times I posed just such a question earlier in my career!) It is during this part of the process that I am also looking for where I am in the chord at any given time in order to anticipate and address as many intonation challenges as possible, before we even play the first note together. We begin our rehearsals having already established goals and priorities. We usually begin with music that is newest and/or most challenging. 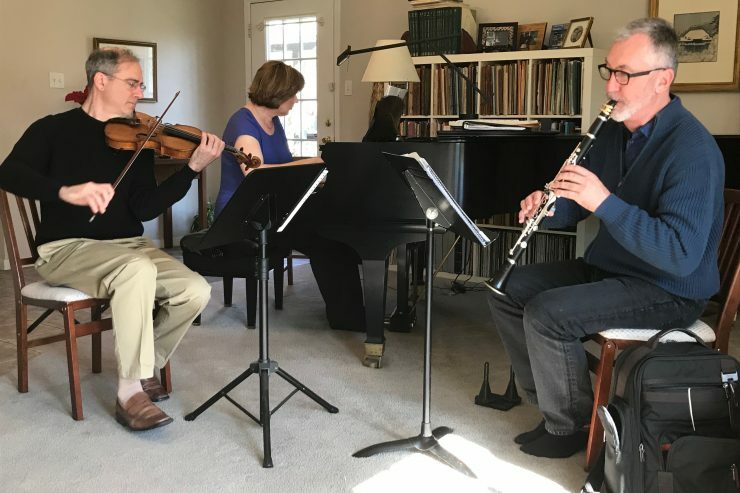 Of the repertoire we covered, only one of the pieces, the Trio by Margaret Brouwer, was completely new for us, so we began our first rehearsal with that. We read each movement first to simply hear and experience the music with one another, as everything always sounds and feels different in context. Especially with fast and technically challenging music, we spend a great deal of time practicing slowly so we can fully hear and absorb all that’s happening in our parts as we are playing together. We gradually accelerate until we are playing at or near tempo, then repeat the process during the next rehearsal. Once we are comfortable playing at the designated tempi, we will begin a rehearsal playing at tempo to get used to playing the material “cold”, then go back to rehearse and refine. After the Brouwer, we rehearsed the trio Jonathan Leshnoff wrote for us. It’s a fantastic piece and we’ve played it many times. Our individual parts are very challenging and the ensemble is quite tricky so, as usual, we began slowly and gradually worked up the tempi in the faster, more challenging sections. After a brief break, we came back together and rehearsed Slang, one of Libby Larsen’s excellent works for our instrumentation. We’ve played this many times and decided to jump in and play at tempo, then go back and rehearse. 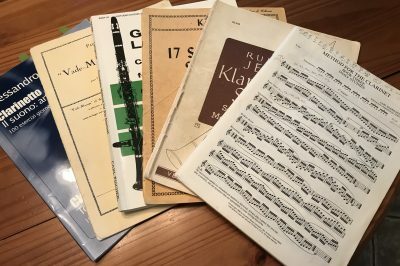 The remainder of the trios we have played so many times for a number of years, and far more recently than the three works with which we chose to begin our work during this retreat. So we came to these old friends after our lunch break and read through each trio to refresh ourselves and bring to the table new ideas each of us may have had about the music since the last time we played it together. We enjoy this part of the process so much that we almost always start out by playing every movement twice. In fact, “playing it twice” has become a standing joke in our rehearsals of music that is so familiar, so deeply embedded in our repertoire. But there’s a quote from Waiting for Godot— “Habit is the greatest deadener.”—that comes to mind, and complacency is the very last thing any of us wants to bring to the table. So we do our best to constantly listen, rehearse, and perform as if it’s the very first time, with new and fresh ears eager to always find greater possibility. We have great personal and professional respect for one another, so we deserve to always be honest with one another. There have been times during rehearsal when one of us has played a passage, thinking it was the best he or she had ever played it, thinking “wow, that’s the softest I’ve ever played that and my colleagues will be so impressed/happy”, only to have someone say “can you play that more softly next time?”. But the wonderful gift is that the answer to whatever that question might be is “yes” 99.9% of the time, and we are always better off for having asked. By sharing our approach to Day One of our retreat, I’m offering a brief glimpse into our process of learning and preparation. It’s wonderful that we truly enjoy spending time together, whether in the midst of intense rehearsal, traveling together, or just hanging out and preparing meals together. It’s been almost 30 years since we first played together and we’re still going strong! 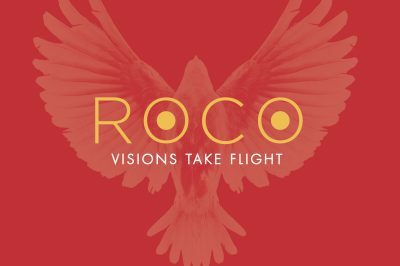 Visions Take Flight: ROCO's first commercial recording is released!